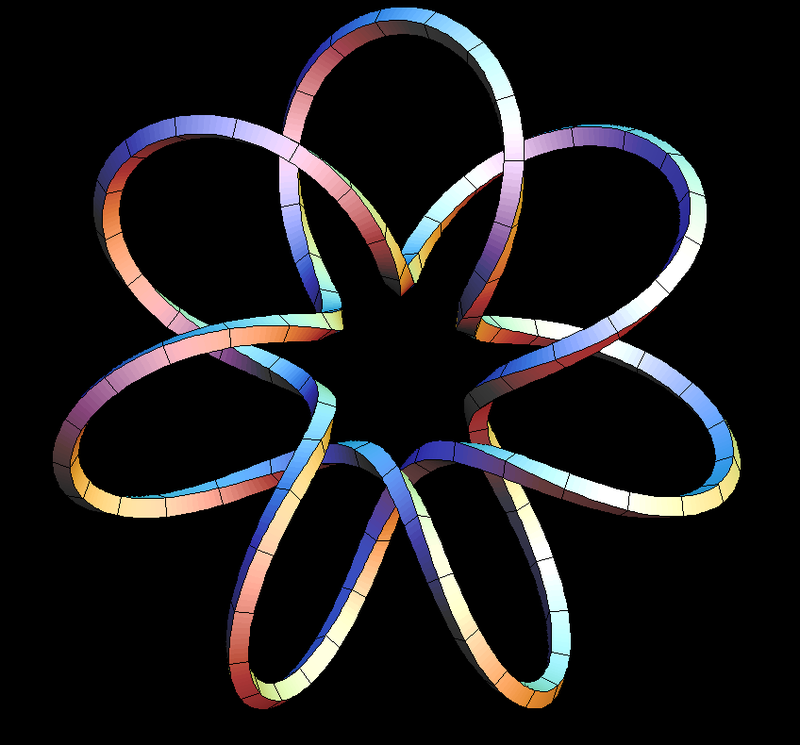 The only well known curves of constant curvature are planar circles and helices in R^3. 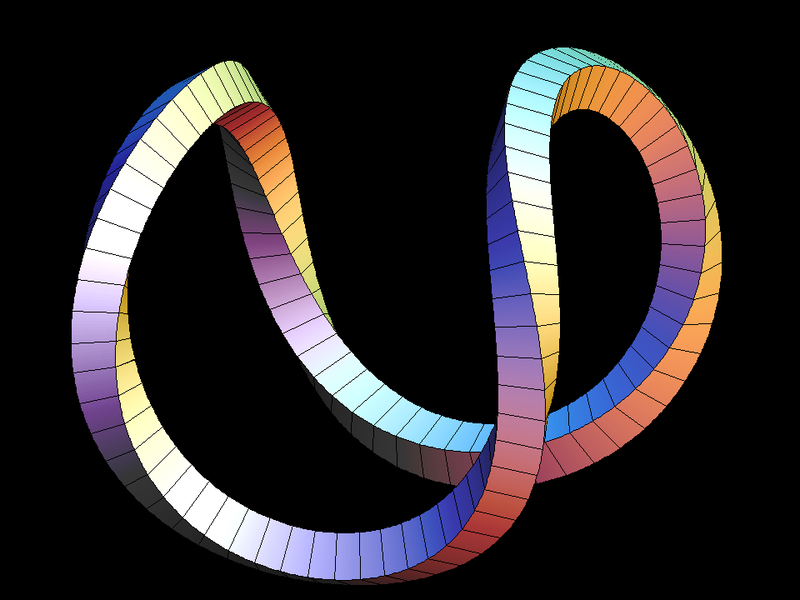 One can put pieces of these curves together to make closed nonplanar curves of constant curvature, but these curves cannot be 3 times differentiable because the torsion is a step function. The closed constant curvature curves on this page are analytic. Most of them are shown as anaglyphs, to be viewed with red-green glasses. Tangents of a curve are “best approximating” straight lines. 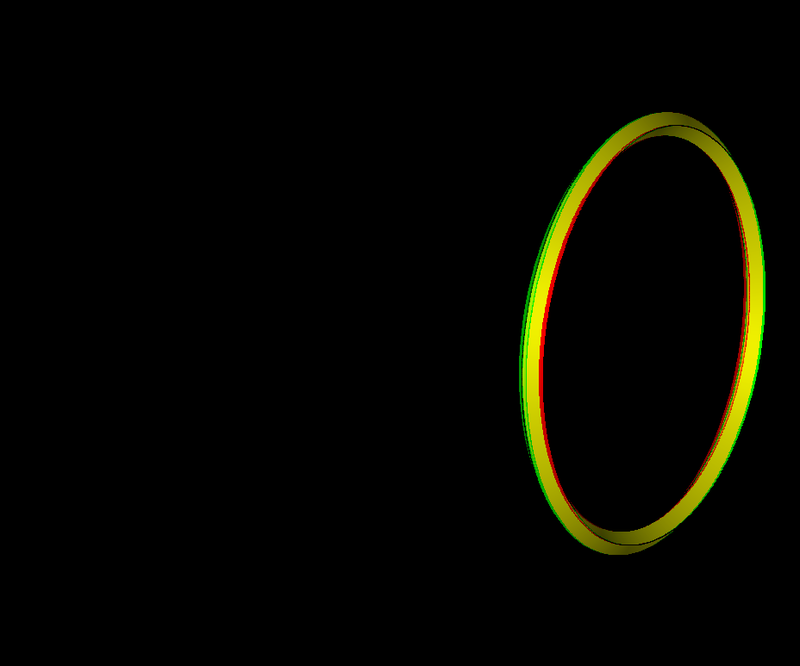 “Osculating circles” of a curve are “best approximating circles”. Such circles have at the contact point the same first and second derivative as the curve and therefore also the same curvature. Curves of constant curvature have osculating circles which all have the same radius. The shown curve has this property, it is a space curve of constant curvature. 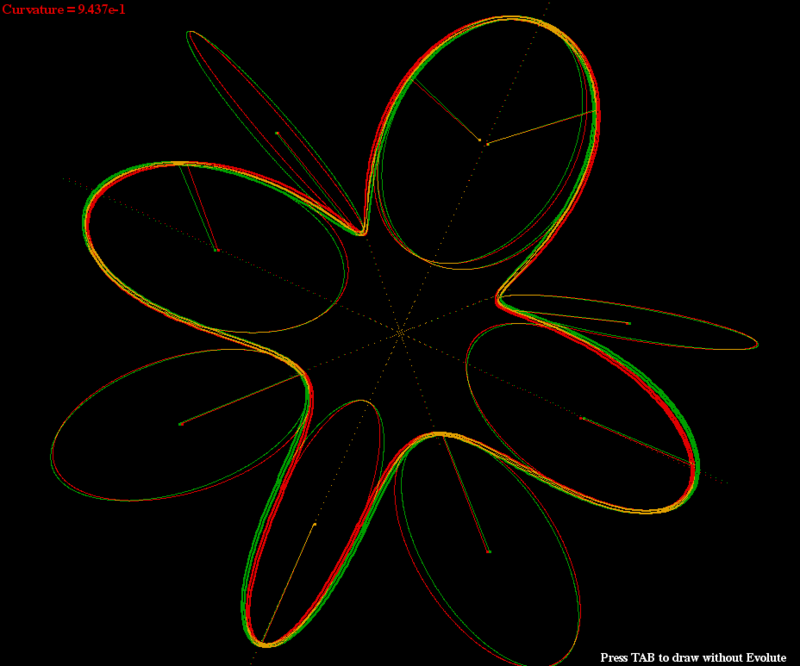 The dotted lines are “symmetry normals”: 180 degree rotation around these normals is a symmetry of the curve. One can roll a plane with a circle to a cylinder and adjust a deformation of the circle so that it continues to be a closed curve of constant curvature. 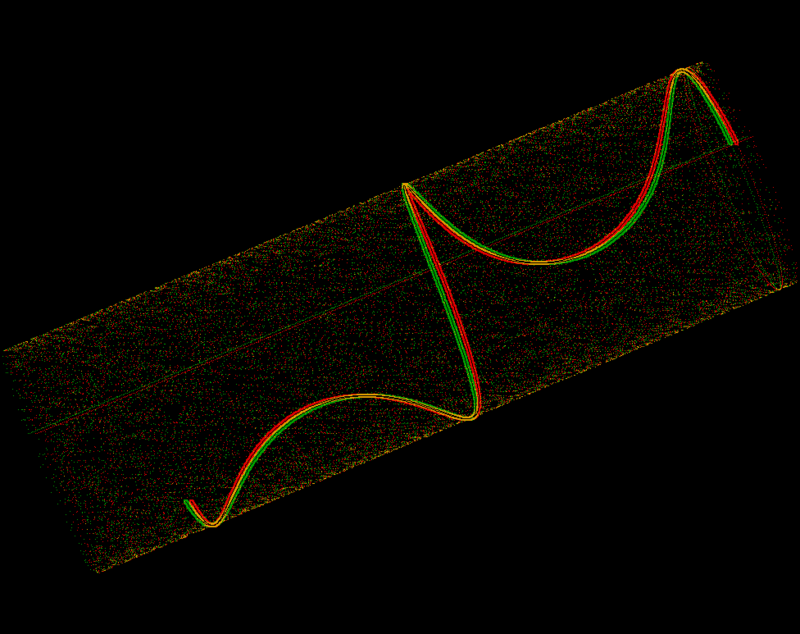 The same constant curvature curves on different cylinders as in the previous sequence. 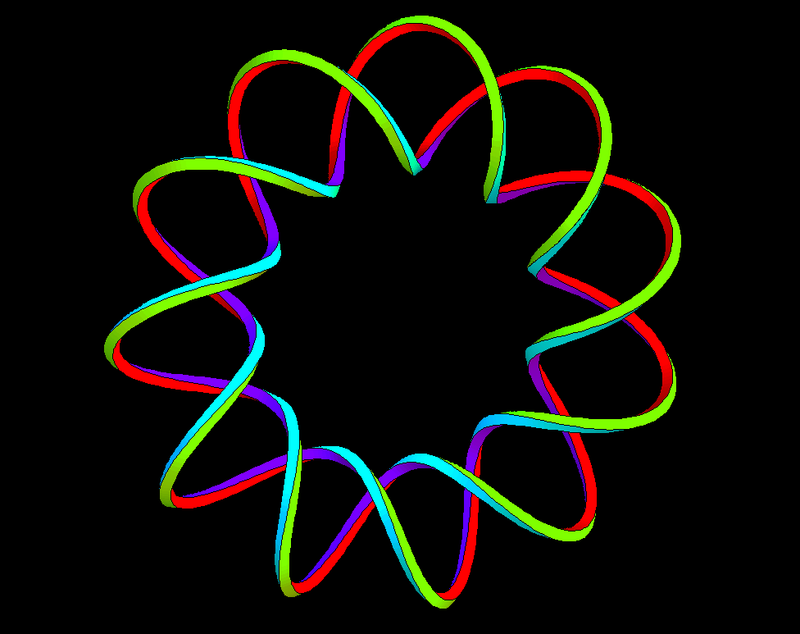 A family of longitudinal constant curvature curves on a cylinder. One of the previous curves as tube. 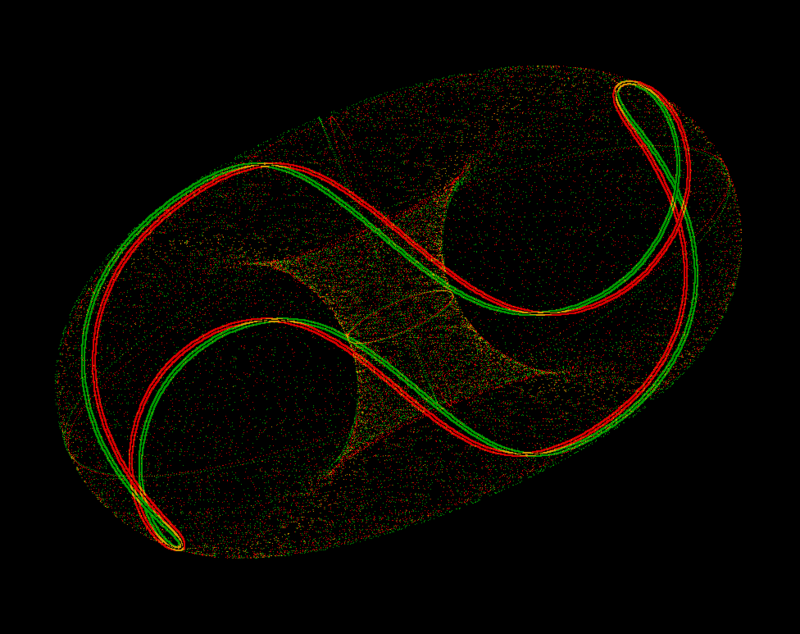 Similarly oscillating curves (as on cylinders) can be found on tori. Again, they are constant curvature space curves. This curve looks as if it could be in a family of curves on a cylinder. But for this curve the four “circular” pieces are congruent, while on the cylinder only opposite pieces are congruent and neighboring ones are not. 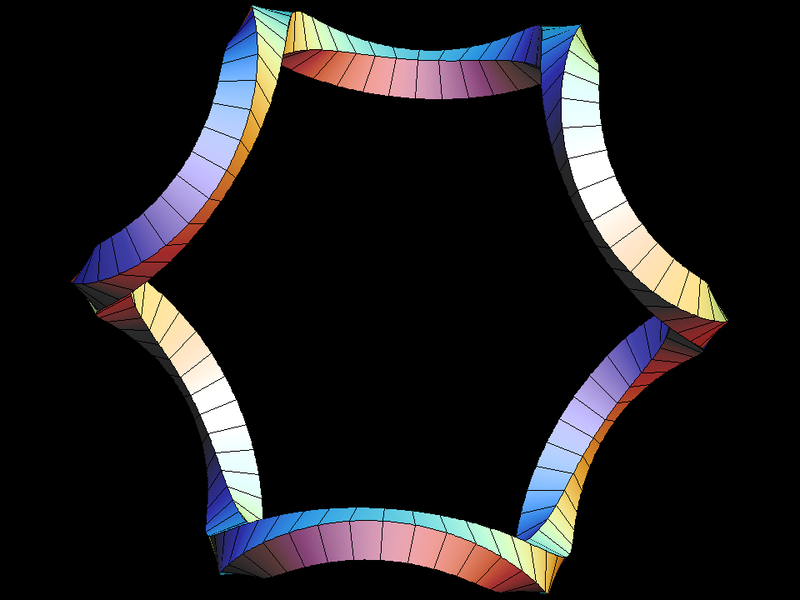 This curve with three upwards and three downwards almost circular pieces resembles the curve which we show on a torus. Both have the same symmetry group but very different constructions. This curve has two parts where the torsion is small and the curve is close to a piece of a circle. 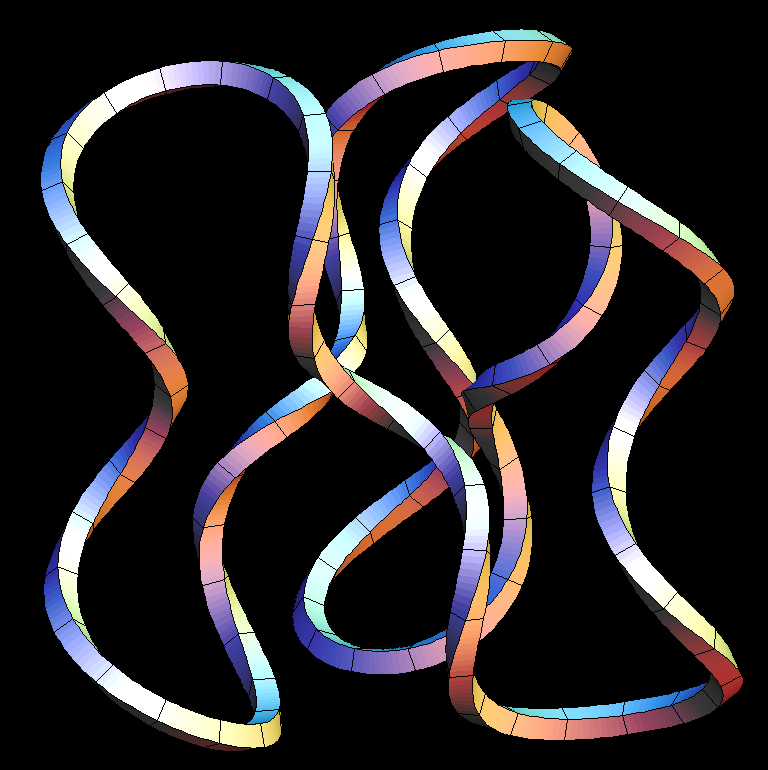 And it has two parts where the torsion is large and the curve resembles a piece of a helix. This curve has 6 circular pieces and six resembling pieces of a helix. This is not exactly true because the torsion is not piecewise constant but a smooth function. 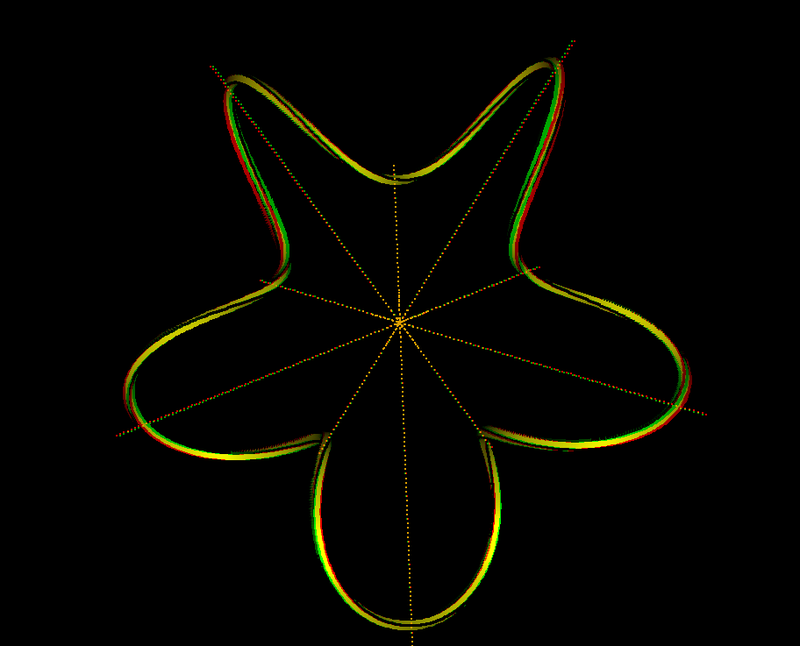 A 5-2-knot as constant curvature space curve. 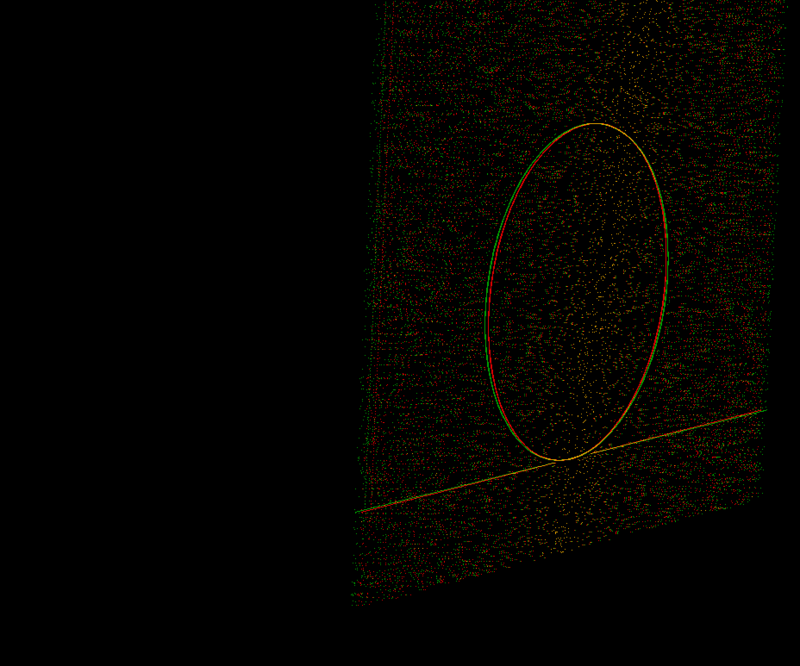 The symmetry normals are a tool for their construction. 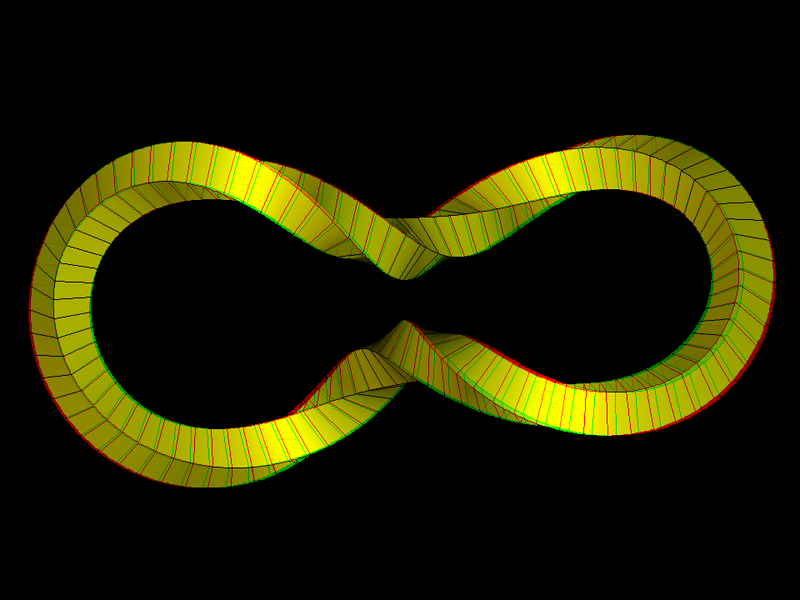 An 11-2-knot of constant curvature. This is a family of non-closed constant curvature curves. The only difference between them is, that constants are added to the torsion function. 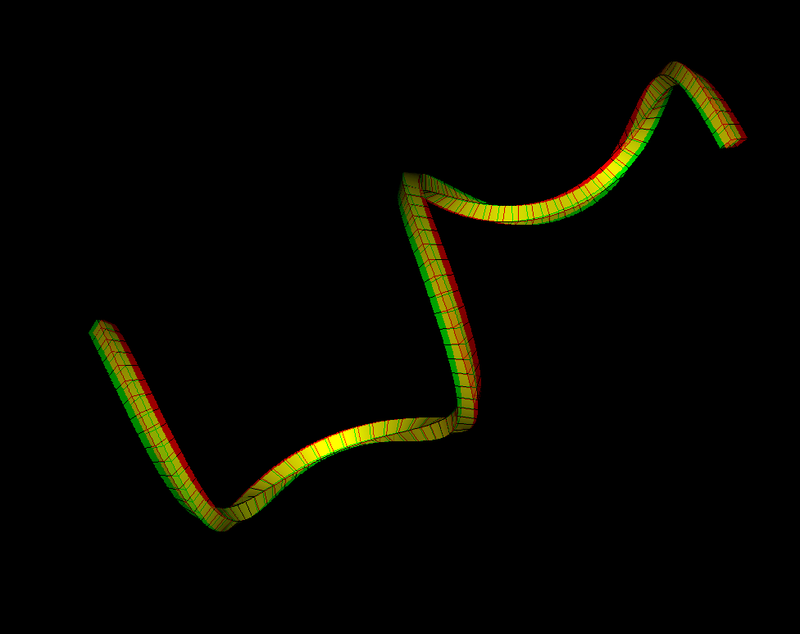 As these constants increase, the symmetry normals are spread apart to lie on steeper and steeper helicoid surfaces. The observable fact that the distance between adjacent symmetry normals increases roughly proportional to the added constants can be used to construct closed curves. In this family of constant curvature space curves a Fourier coefficient of the torsion (= a trigonometric polynomial) is changed and the mean value of the torsion is adjusted to keep the symmetry normals passing through one point!! The possibility to do this relies on the observation of the previous sequence. - The animation shows how one can get further closed constant curvature space curves, by starting from one and following the described deformation. 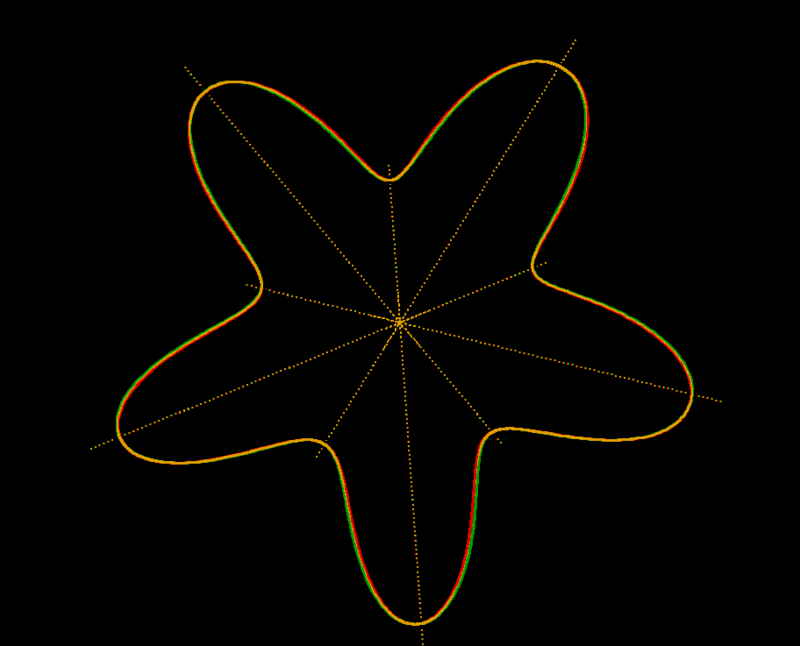 The shown deformation passes through a 9-2-knot and almost reaches a curve with 4-fold symmetry. 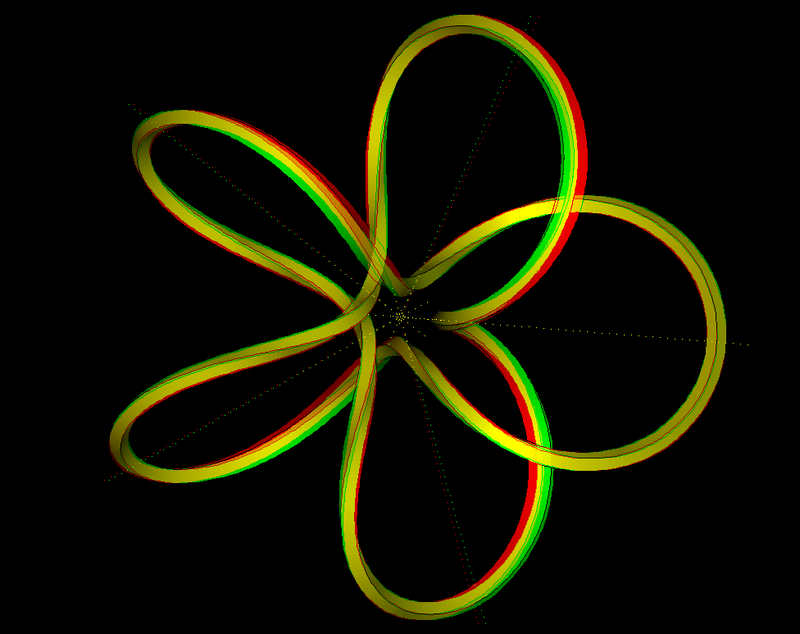 A rotating 7-2-knot of constant curvature.